Have you ever seen something handmade that catches your eye, and you think, “I wish I could make that!” That happened to me quite a while ago. I saw something I absolutely loved, but it was knit. The downfall to not being a knitter is I can’t make the beautiful things I see! The pattern said it was made with the “moss stitch”, so I set out to find a crochet version of that particular stitch. 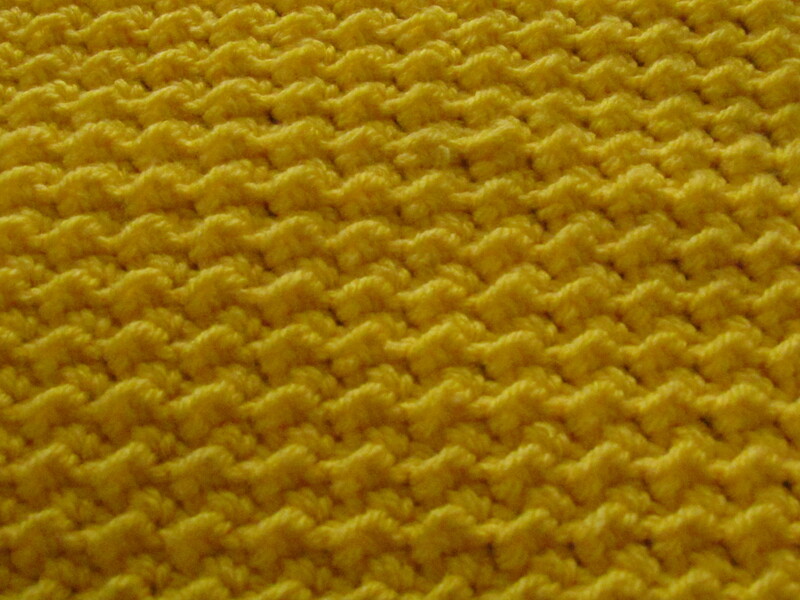 As most of you may be aware, the moss stitch in crochet is also known as the seed stitch, which does not look like this. I was determined to find something! (I get like that sometimes) I didn’t necessarily find a stitch that matches perfect, but I came across a combination of stitches that is really close. I decided to try out my stitch combination on an afghan square for my Baker’s Dozen group on Ravelry. Here’s a picture of what I came up with. Now that I had found something, I wanted to write a post about it, but I didn’t keep track of the original photo I had seen for comparison sake. I went looking, and because I don’t know much about knitting, I need to ask…..Is there more than one moss stitch? I looked at tons of photos, but they weren’t all made with the same stitch (or at least it didn’t look that way). I finally found this photo over at Firefly Cottage, of this beautiful cowl, and the stitch looks very similar to what I had seen. Please Note: The photo was used with permission from Gigi @ Firefly Cottage. Unfortunately her post is no longer available on her site, so I have linked the archive to it if you’re instersted. So what do you think? Did I come close? in following rows you will slip stitch in the hdc, and you will hdc in the slip stitch. If this doesn’t make total sense, do not worry. Here is a free pattern for an afghan square for you to practice with. I love the moss stitch! I learned this pattern a while back when I was looking for dishcloth patterns. It makes a great washcloth, I never thought of making anything else! That is really a fun stitch. I used it tonight to start a dishcloth. I really like it. Thanks for posting abouat it. Late last night I saw your post on my iPad and I thought: this is looking great. But now on my computer screen – which is much larger – it is even better! I love these combination of stitches. Very nice post! Gosh why I always make typos? I meant to say: I love this kind of stitch combinations. I love the stitch, such a beautiful look to it. Looks fab but what size hook is best? I use whatever hook size is recommended for the yarn you’re using. I used an I hook for this sample. Thank you, I’ve had the same “obsession” with finding this particular stitch! I do knit, but crochet is faster! Thanks again! I know this is years after you first posted this, but I have an answer for you. Yes, there are quite a few moss knit stitches out there. My favorites are the traditional, also know as the seed stitch, and the Irish moss stitch. Also, thank you for writing this–I’m currently knitting an afghan using the moss stitch and need to make borders for it–but I don’t think I can fit 157 stitches with size 6 yarn on to 36″ circulars. So I have been looking for a crocheted version and I agree the traditional crochet moss stitch doesn’t look alike at all. So thank you! Tabatha, you should be able to click on the picture and it will take you to her site. Lovely… bit of a problem knowing what is the her and w h at is slip stitch when on the next row. It does take a bit getting used to the 2 stitches and knowing which is which. You could try to put a stitch marker in either one on a few of the stitches until you get used to it visually. That might help. The photo that is in yellow is the Even Moss stitch and the pattern is the same on the reverse side. Very pretty done in hdc, you do a hdc the a slip stitch(not a sc) and it’s beautiful.